Limited Liability Company (LLC) status: Is it a good idea for writers? I’m self published author. How to I set up my publishing company? I learn a lot at writers conferences. Here’s a list for IN, KY and OH. Join me in Louisville, Kentucky August 1-2, 2014 at this summit for writers looking to get published or better market their books. 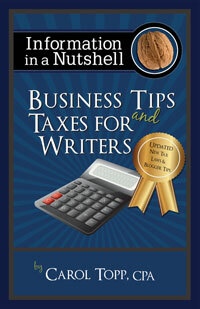 Carol Topp, CPA has been invited as the faculty at 3 writers conferences in the late summer and fall.